Things spiral out of control in a high school in Manhattan when a terrible accident involving a science experiment injures a kid for life. A who-dun-it with a how-they-saw-it leads to an explosion of emotions touching on everyone involved: the teachers, the parents, the school authorities and, ultimately, also the students. 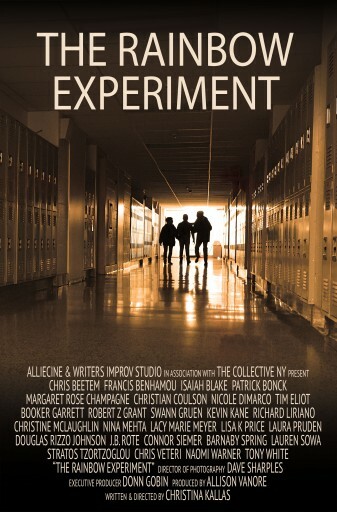 The Rainbow Experiment deals with the theme of forgiveness. The film shows the events of one day in a single location, where the stories of its 30+ speaking roles converge in a widescreen ensemble work with multilayered soundtracks and Kallas’ experimental use of split screens. Following the completion of 42 Seconds of Happiness, producer Allison Vanore and writer-director Christina Kallas are preparing for the next film, The Rainbow Experiment. Over the last year Kallas has worked with an ensemble that includes several members of the notable actors' group The Collective NY. She has been workshopping The Rainbow Experiment with them using her writers improv method, which aims at the mergence of actor and character. During the workshop members of the ensemble perform impromptu scenes from the storyworld, which Kallas sets up in front of the other actors of the ensemble who in turn participate via a technique Kallas describes as emotional doubling. This enables a different kind of interactive involvement deepening the work with the characters and preparing the actors for the concrete approach better than classic rehearsals or readings might do. In my films I am experimenting with narrative form, multi-protagonist, sometimes nonlinear structures, in an effort to allow, emulate an experience that is as close to experiencing reality as one can get. The workshopping part of the process and the naturalistic performances are important in that sense, as is the choice of camera work or the multilayered soundtracks or indeed my experimental use of split screens. The most important element however, is how the narrative is structured: I see it much like when we join a party as a guest and need time to orientate ourselves to how everything and everyone are connected and then suddenly, after witnessing a key moment, we understand more and retrospectively what we have experienced and why we have experienced it that way. I am intrigued by how cinematic narrative is evolving beyond the traditional story format, and how it influences the way we perceive reality. What I am interested in, frankly, is what’s beyond, above and underneath what we call reality. We are still raising money for post production, marketing and distribution costs. Please take a moment to check out our donation page on Fractured Atlas and make a tax deductible donation should you want to see The Rainbow Experiment succeed. Thank you!